An effective lawn fertilizing schedule encompasses the entire year. But for many people, it doesn’t make any sense to apply fertilizer to their grass in the fall. After all, the grass is about to go dormant for the winter. If there will be no growth and no greenness for a few months, why bother fertilizing now? Keep reading to learn why fall is one of the best times for effective lawn fertilizing. It’s true that your grass will do very little in the winter months. But until it goes dormant, the grass is storing extra nutrients that it can use in the springtime. As you know, spring is when the turf starts to green up and start growing again. The nutrients your grass puts away now will still be available to it in the spring. That extra energy will allow the grass to grow greener, thicker, and more vigorously when it really counts. Even though your grass doesn’t seem to grow or put any effort toward being green in the winter, it still consumes some nutrients during the cold months. Leaving the grass in barren soil could end up damaging the plants in the winter. If the grass has to spend time in the spring recovering from a rough winter, it will make your spring growth less than splendid. Fall is a great time for an effective lawn fertilizing application. The grass has spent a ton of energy staying healthy and green all summer long. Now, as it begins to enter a quiet phase in its life cycle, the grass plants will benefit from an extra dose of nutrients. It will allow them to recover and repair themselves from any stress or damage sustained in the summer. Plus, any extra effects of the fertilizer will be stored until the springtime. You may be wondering if the story is any different depending on whether you have cool or warm season grass planted in your yard. And the answer is no – all types of grass will benefit from a fall fertilizer application. In fact, the experts will tell you that combining fertilizer and pre-emergent weed control products is the best thing you can do right now to ensure that you will have the best-looking lawn on the street next spring. Even with Atlanta’s moderate winters, grass tends to take a break in the winter time. A busy summer growth season takes a toll on each blade of grass. Just like people need to sleep and recharge at night, your lawn needs a break and it occurs during the winter months. Before winter arrives, be sure to have a high-quality fertilizer applied to your grass by a professional. 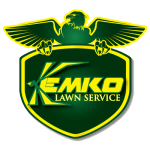 Call our lawn experts at Kemko Lawn & Shrub at 770-466-6113 to schedule your effective lawn fertilizing appointment.